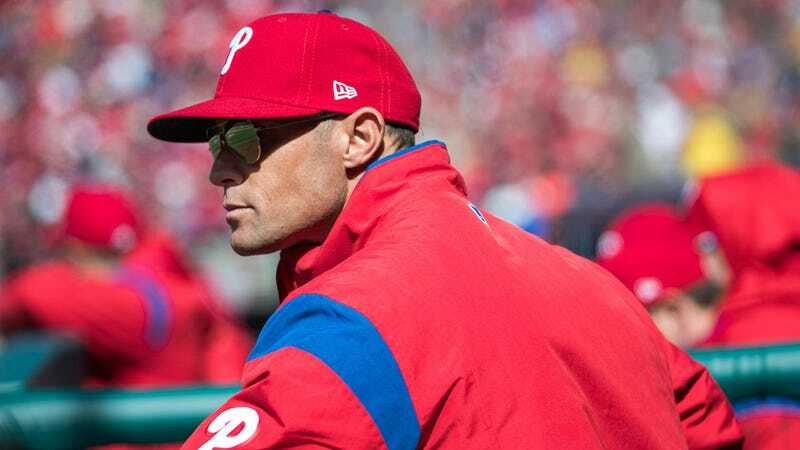 Phillies manager Gabe Kapler during yesterday’s 5-0 win over the Marlins. On Thursday, the Phillies won their home opener for the first time since 2011. They did so easily, in a 5-0 win over the Marlins where Miami had just four baserunners. The game even ended in 3 hours, 3 minutes. Pretty quick for a game where the Phillies saw 177 pitches! It was a great day at the ballpark. But it was not a great day for Gabe Kapler, overall. He was booed in introductions (the Phillies tried to slip him in quickly, too, but fans booed anyway). He was booed when he took out starting pitcher Nick Pivetta in the middle of the sixth inning. The biggest cheers all day were for Eagles coach Doug Pederson. Texts and comments underscored the excitement of the detractors over his early misstep(s). One even happily suggested via text message that he should consider his true calling as a Chippendale dancer. One said he loves watching the postgame press conferences, which he likened to “The Bachelor,” with the potential for a train wreck. Williams arrived to Citizens Bank Park on Thursday already knowing that he was out of the lineup. Kapler has texted him his playing schedule in advance. Williams said he’s never had a manager text him like that. The one bonus, Williams said, is Kapler’s alerts allow him to stay up late playing video games without feeling guilty about it. Williams does not know when he’ll play next, but he said he will prepare as best he can. With the way Kapler’s setting his lineups so far, Williams will have enough video game experience to be on the Philadelphia Fusion pretty soon. It is six games into Gabe Kapler’s managerial career. It is not fair, but many people have already made up their minds about him.